Hospice work is not glamorous. However, it is vital to those in need. The Edwardsville Rotary Club recognized Southern Illinois University Edwardsville School of Pharmacy student Kayla Link, of Springfield, for her dedicated service as president of the University’s Hospice Volunteer Initiative and other community work. Link, a third-year pharmacy student, was chosen as the Edwardsville Rotary Club Student for November. Herndon, faculty advisor for the SIUE Hospice Volunteer Initiative, nominated Link for the award. Link consistently models the Rotary motto of “Service Above Self,” added Herndon. The organization educates the University community and others on the basic meaning of hospice, according to Link. Link is also active in the American Pharmacy Association-Academy of Student Pharmacists (APhA-ASP). The nationwide organization provides opportunities for professional growth, to improve patient care, and to envision and advance the future of pharmacy. Link will be recognized for the award at the SIUE Kimmel Student Involvement Center Leadership Awards in spring 2019. Rotary is a global network of businesses and professional leaders who provide humanitarian service, encourage high ethical standards, and help build goodwill and peace. The Edwardsville Rotary Club is one of 35,000 clubs worldwide. 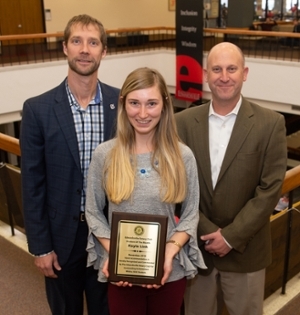 Photo: Kayla Link, a third-year student in the SIUE School of Pharmacy, won the Edwardsville Rotary Club Student of the Month for November. Nominating her was (right) Chris Herndon, PharmD, professor in the Department of Pharmacy Practice and faculty advisor for the SIUE Hospice Volunteer Initiative. Also congratulating Link is (right) Kevin Buhr, Edwardsville Rotary Club district director for Madison and Bound Counties.